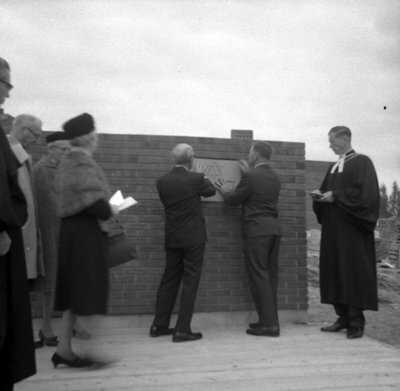 A black and white photograph of the laying of the corner stone for the new St. Andrew's Presbyterian Church. Winter, Brain ; McClure, Reverend W.J.S., Wilson, D.A. ; Wilson, A.M.
St. Andrew's Presbyterian Church, October 1, 1967, Brian Winter. Archives A2013_004_339.